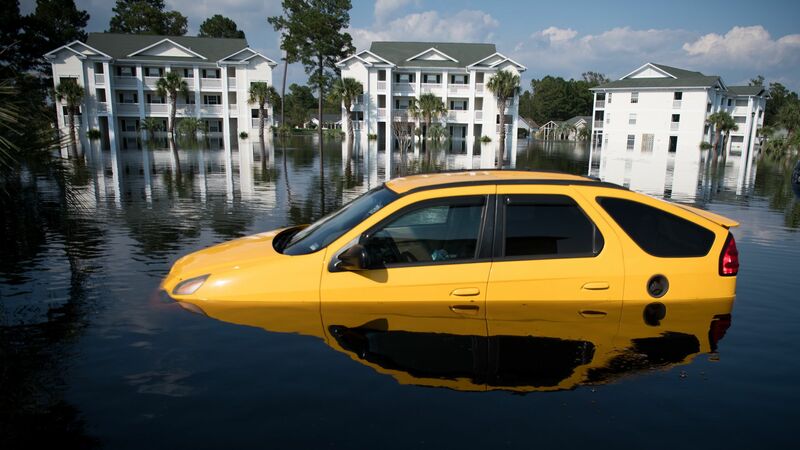 The flooding from Hurricane Florence continues in the Carolinas, after the storm dumped an epic amount of rain. Rising waters have breached dams and overtopped levees, and pollution concerns are growing as hog waste and coal ash enters swollen rivers and lakes. The big picture: Photos taken using DigitalGlobe's satellites show a dramatic contrast between the landscape before and after this historic storm. The company, which operates a fleet of Earth imaging satellites for civilian and government use, released these images as rivers were still rising. The images are centered around the community of Wallace, North Carolina, about 35 miles to the northeast of Wilmington, near the Cape Fear River. Satellite images showing flooding from Hurricane Florence in Wallace, North Carolina, on Sept. 20. Photos: DigitalGlobe. A flooded chicken farm near Wallace, North Carolina, on Sept. 20. Photos: DigitalGlobe. Flooded Henderson Field Airport as seen from space on Sept. 20. Photos: DigitalGlobe. Flooded Riverside Landing in Wallace, North Carolina, due to Hurricane Florence. Photos: DigitalGlobe. What's next: In some parts of the Carolinas, rivers are still rising. Floodwaters will slowly recede this week, leaving behind a massive, multiyear cleanup effort.